The water resources act was introduced to place legal restrictions on industrial discharges either to ground, to waterway or storm-water drain - with good reason. Reducing the amount of oil released into the environment is important. Just 250ml of oil can cover acres of water surface, reducing the effectiveness of treatment plants, preventing oxygenation, and killing wildlife. A modest 18kW compressor might generate close to ten thousand litres of condensate each year, often containing up to 1000ppm of oil and other waste at the point of discharge. 99.9% of condensate is water, so it makes sense to clean it on site before discharge to the sewer. Outlet to the sewer system is controlled by local authorities, which do not usually allow discharges containing more than 20ppm of oil to be introduced to the drains. Expectations are that limits will reduce in the future; some European countries already insist on a maximum of 10ppm SEPURA offers the most economical, simple, reliable and environmentally sound method of complying with the legal requirements - with outlet quality better than 10ppm for up to 4000 hours of filter life in many applications. We also offer special filters for specific ‘problem’ condensates. Only SEPURA gives you this performance. It isn’t complicated... Sometimes, keeping it simple keeps it working! 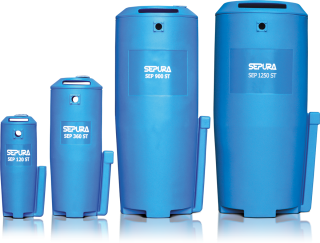 With SEPURA there’s no moving parts and no stagnant reservoir of condensate to breed unhealthy bacteria. There’s no need to guess the height of the oil overflow because there isn’t one, so there’s no blockages or floods either. It also means there’s no oil container to deal with, because all the oil is retained in the filters. 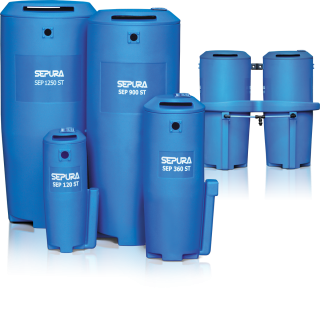 It’s easy to select the right SEPURA separator; it’s quick and foolproof to install; clean and simple to service, and we believe in most cases it’s also the most economical tool for the job. Tens of thousands of installations world-wide experience SEPURA satisfaction. 10-year warranty Terms & Conditions Apply.